This tasty warm salad takes advantage of the short asparagus season, celebrates the arrival of Jersey Royals and makes the most of other fresh produce. If you only cook one thing this month, make this. Put the potatoes in the top of a steamer over a pan of boiling salted water, cover and steam for 7 minutes. Add the asparagus and steam with the potatoes for a further 8 minutes until everything is tender. Remove the asparagus to a warm dish. Tip the potatoes into the drained saucepan with the spinach; add the butter, tossing until it melts in the residual heat and coats the vegetables. Add the dill and lemon juice and stir well. Season to taste and remove from the heat. 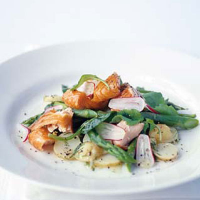 Divide the potatoes, spinach, asparagus and radish leaves between the plates and top with the hot-smoked salmon and sliced radish. Spoon over the dressing from the bottom of the pan and grind over some cracked black pepper.